Necessarily short post today as Mrs. E. has us giving a dinner for six to welcome out of town relatives of one of her colleagues. It is to be an early supper and that gives me roughly five hours to tune up the manse, rearrange the library (paperbacks were moved upstairs and the ever-expanding Easy and Elegant Life source books will finally get off the floor), set the table and get the food going. Oh, and I think we need another bottle of bubble as there was only one Fleuraison left at the store and a bottle of Côtes du Rhône Rouges for those who don’t drink white wine. Tonight’s supper will be Rôti de Porc aux Pommes de Terre et aux Oignons. 1 bone-in pork sirloin or blade roast about 3 1/2 – 4 lbs. Preheat oven to 350ºF. Thinly slice the garlic cloves lengthwise. Make slits in the roast and insert the garlic. Try to do distribute evenly. Oil the roast and season with the salt and generous amounts of pepper. Place onions in a baking dish. Set the roast on top of the onions and surround with the potatoes (in around and under if necessary.) Salt and pepper potatoes. Place on center rack of oven and roast about 2 1/2 hours (to an internal temperature of 165ºF at the thickest part away from the bone.) Remove from oven and let sit 15 minutes (keeps the meat from looking grey when you slice it as the juices are reabsorbed whilst it rests.) Slice and serve on a warmed platter or carve at the table. Serve with hard cider for the most authentic experience. That’s what I’m supposed to do. Except I can’t resist monkeying around with a recipe. Especially since I was in the mood for the hearty pork and vegetable stew with farz (buckwheat dumplings that resemble couscous) or a cassoulet. I imagine I’ll up the pork content with some sausage and flavour it more with a slab bacon/smoked pork jowl thing. I may even work up into a few white beans for good measure. If I do, they will be cooked with the sausage and some of the drippings from the pork. The debate continues to rage over the white asparagus as a first course, since the onion soup that I originally had planned would put us over the top onion-wise. I may just stick with a green salad dressed with balsamic vinaigrette, topped with croutons, goat cheese and a caramelized (ed: updated that. Actually caramelized walnuts from Spain) walnut or pecan. Mercifully our guests are bringing the dessert and a cheese tray. This entry was posted in Entertaining and tagged "The French Farmhouse Cookbook", An Aesthete's Lament, Entertaining, Fleuraison, Roast pork recipes. Bookmark the permalink. Check out Barefoot Contessa’s salad dressing – I use it all the time and it is very yummy! Have a great time at your dinner party! 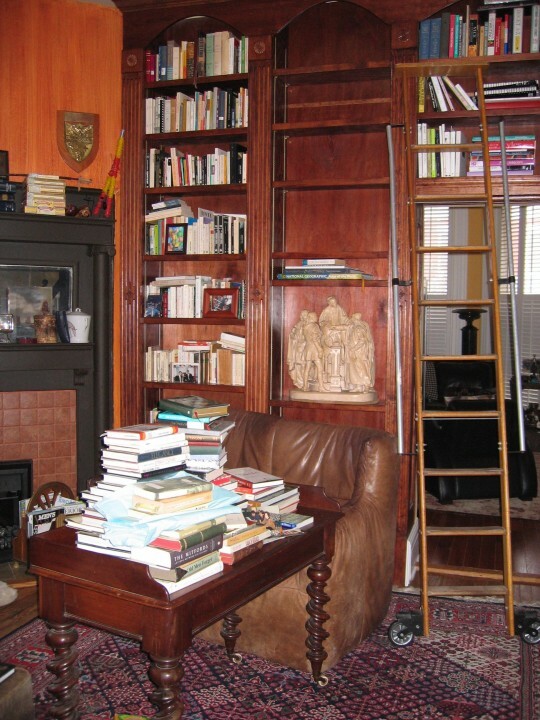 PS…the next time I am driving to Florida I am sooooo stopping by to sort out your bookshelves! I love getting ready for a dinner party. All this turning things over is so much fun. I hope you had a fantastic time. It sounds like a nice evening. Take care. Have a great week. In my head this tastes absolutely delicious. Party time! Not to invite political comentary or waylay an unsuspecting party post, (sounds wonderful by the way, like something my Polish/French grandmother used to cook) but are those a torero’s banderillas or palos on the mantle? Any provenance there? I wish I could have been one of your guest, as I would love to get to know you and your lovely wife better! I know it was a wonderful evening! Thank you all. Almost done with a quick and dirty rearranging of the library shelves. Will start cooking by 4 PM. The flights were delayed and bought me another hour! Small mercies. Cap’t. Indeed. They were bought in London after the war by Mrs. E.’s father who collected all sorts of wonderful things. Like jade snuff boxes and the closures for kimonos. Interesting kid, huh? The torero’s sword was a gift from a handyman friend who lived in Spain as a kid. 1950’s. Karena, let me know when you swing through town. I’ve half a mind to open up the New Year’s party to all EE&L readers; but there are thousands of you a day and … well, BYOB is too collegiate. Maybe next year. Interesting… Papa Hemingway would approve. A sign that one is too involved with one’s blog reading….7pm CST and wondering “I wonder how Easy’s dinner party is going”?. I hope it was as wonderful as you hoped. Pork with potatoes and onions – sounds easy but not so sure about elegant, and as for your link to the “aesthete’s” suggestion of french farmhouse cookery, it sounds more like the “Irish poverty cookbook”. Still, we love your ironic New World references to: “a bottle of Cotes du Rhones Rouges [sic] for those who don’t drink white wine” [who does drink white wine except as an aperitif, or maybe with white fish such as plaice? ], “drippings” [yuk] and “candied walnuts” – in a salad! [double yuk]. I’m sure you could do much better E. David, turning in my grave. I tend to cook peasant food as I find it pleases almost everyone, the food is dressed up by the table. Am I mistaken that Côtes du Rhone also comes in white and rosé? We’re so glad that we can amuse, bless your heart and thank you for reading Easy and Elegant Life. Feel free to submit photos and a menu that you’ve created, I’m sure that we have much to learn from you. I imagine you pulling this party all together with ease and not a drop of perspiration on your forehead as “dinner is served”. Pork/potatoes/onions – yum/squared – delightful and delicious! Have a very day tomorrow. Hi Paul, thanks. Actually had time for a dressing drink for once. It went fine. Peasant food can be very acceptable, especially when eaten in appropriate surroundings in the country concerned. But why not move up a level and try something from my namesake’s classic cookery book “French Provincial Cooking”. Miss David provides a wonderful, and simple, recipe for Carre de Porc Provencal [roast loin of pork with wine and herbs] and suggests serving it with Pommes Mousseline Facon Provencale. You may have much to learn [we all do] but please don’t change; your blog – to those of us in the Old World – is hilarious! Sounds delicious!! Hope it went well! how fascinating that blog bitchery is alive and well – if not too subtle or witty – in the Old World. Hello Jen, thank you for dropping by and for the kind comment. I’ve done a few posts on women’s clothing and accessories, and am trying to include more. It’s a trickier subject as you are more susceptible to the whims of fashion. I prefer a very classic sort of elegance updated with a new piece here and there. Search the blog and you may find one or two articles to your liking!